I’ve always regarded the weather as a bit unpredictable. Ok, the winter weather here is a little mild. 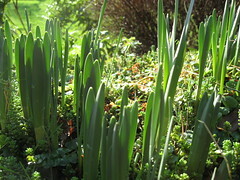 Daffodils coming out to bloom now is… a little strange, I think. Well, I am not convinced. Then I mistakenly turn on the TV tonight to catch Climate Change: Britain Under Threat. Which makes one feel like we are at war not just with Iraq, Afghanistan… but now with bloody mother nature. Scary. Interesting. I seem to notice earthquakes far more. A Korean friend reported one last Saturday, and look here… another one. Great, more things to worry about.